If you were walking around the Enterprise Connect expo hall today, you may have been surprised to see what appeared to be a giant red spacecraft poking out from booth 518. You would not be wrong. Today, Zailab debuted The Lander at the Enterprise Connect expo – a large contact-center, communications and cloud event taking place in Orlando, Florida, from March 18–20th, 2019. Like the ZaiTruck at last year’s expo, The Lander was designed to turn heads and draw visitors to the Zailab stand, where the team is on hand to introduce and offer demos of our cloud-based contact center solution. But the 12.8-foot-tall Lander is not just a futuristic prop. Built in-house by the Zailab industrial design team, the 3.6-ton craft was created to give attendees a truly out-of-this-world experience. Visitors are able to board the vessel from an authentic spacecraft-style platform. Once inside, 10 screens and LED lighting provide an immersive exhibition experience that tells the story of Zailab and our cloud platform. The extraordinary audio–visual experience was created by Zailab’s marketing team, which includes the industrial design team, a videographer and other creatives. We will be exhibiting our cloud offering at Enterprise Connect till March 20th, 2019. If you are attending the expo, we encourage you to visit booth 518 to meet the team and take part in The Lander experience for yourself. 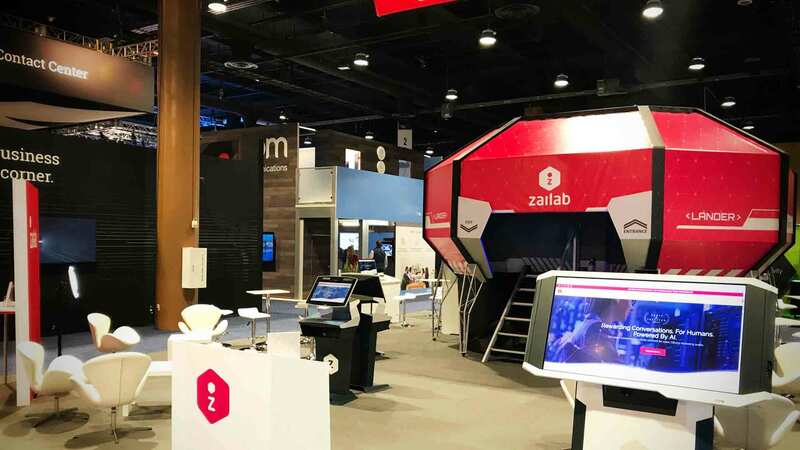 In addition to The Lander, the Zailab stand features demo screens as well as feature videos, which explain the benefits of our cloud-based contact-center solution. Visit today to meet CEO Nour Addine Ayyoub, Sales SVP Michael Cibelli, our US Channel Directors, and Marketing VP Marya Dzmitruk. After Enterprise Connect, the team will showcase Zailab’s contact-center solution at the Channel Partners Conference and Expo taking place from April 9–12th, 2019.